Ship-to-ship (STS) transfer operation – It is an operation where crude oil or petroleum products are transferred between seagoing ships moored alongside each other. Such an operation may take place when one ship is at anchor or when both are underway. In general, the expression includes the approach manoeuvre, berthing, mooring, hose connecting, safe procedures for cargo transfer, hose disconnecting and unmooring. Prior Ship-to-Ship operation reference should be made to the vessel’s ship specific STS Plan. Risk Assessment is to be undertaken in accordance with the STS Plan. STS locations shall be individually risk assessed and the assessment approved by the management office. Where such an operation is expected the Master will be advised in advance. Before agreeing to a ship-to-ship transfer operation the Master must satisfy himself that all appropriate safety precautions have been taken and are in force on the lightering vessel as well as his own vessel. Procedures and checklists detailed in the ISGOTT Manual and the OCIMF Ship-to-Ship Transfer Guide are to be followed on both vessels involved. All mooring, transfer and safety equipment for STS transfer must be checked and prepared ready for use prior to arrival. During in-port ship-to-ship transfer operations a specialist Supervisor may sometimes be appointed to the ship. The Master must be in no doubt that this appointment in no way relieves him of his responsibility for the safety and security of his vessel and cargo. If a Vapour Emission Control (VEC) system is to be used by vessels during a ship-to-ship transfer operation this must be done in accordance with, and having a full regard to the provisions of ISGOTT. If the Master considers that a proposed STS transfer operation is either unsafe or unnecessary, it must not continue and the Company is to be advised immediately. "1. What is the LOA ? What is parallel body length at loaded and ballast draughts?" 2. Will the transfer be conducted underway and, if so, can the ship maintain about five knots for a minimum of two hours? 3. Is the ship’s manifold arrangement in accordance with OCIMF Recommendations for oil Tanker Manifolds and Associated Equipment? 4. Is the ship’s lifting equipment in accordance with OCIMF recommendations for oil Tanker Manifolds and Associated Equipment? 5. What is the maximum and minimum expected height of the cargo manifold from the waterline during the transfer? 6 Sufficient manpower will be provided for all stages of the operation? 7. Are enclosed fairleads and moorings bitts in accordance with OCIMF Mooring Equipment Guidelines and are they of a sufficient number? 8. Can the ship supplying the moorings provide all lines on winch drums? 9. If moorings are wires or high modulus synthetic fiber ropes, are they fitted with synthetic tails at least eleven meters in length? 10. Full-sized mooring bitts of sufficient strength are suitably located near all enclosed fairleads to receive mooring ropes eyes? 11. Both sides of the ship are clear of any overhanging projections including bridge wings? 12. The transfer area has been agreed? 1. 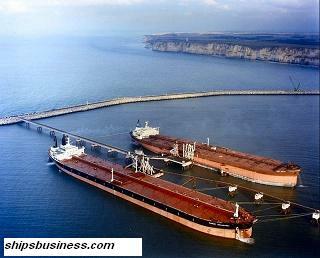 The two ships have been advised by ship owners that Checklist 1 has been completed satisfactorily? 2. Personnel comply with rest requirements of ILO 180, STCW or national regulations as appropriate? 3. Radio communications are established? 4. Language of operations has been agreed? 5. The rendezvous position off the transfer area is agreed? 6. Berthing and mooring procedures are agreed, including fender positions and number/ type of ropes to be provided by each ship? 7. The system and method of electrical insulation between ships has been agreed? 8. The ships are upright and at a suitable trim without any overhanging projections? 9. Engines, steering gear and navigational equipment have been tested and found in good order? 10. Ship’s boilers and tubes have been cleared of soot and it is understood that during STS operations, tubes must not be blown? 11. Engineers have been briefed on engine speed (and speed adjustment) requirements? 12. Weather forecasts have been obtained for the transfer area? *13. Hose lifting equipment is suitable and ready for use? *14. Cargo transfer hoses are properly tested and certified and in apparent good condition? *15. Fenders and associated equipment are visually in apparent good order? 16. The crew have been briefed on the mooring procedure? 17. The contingency plan is agreed? 18. Local authorities have been advised about the operation? 19. A navigational warning has been broadcast? 20. The other ship has been advised that Check-List 2 is satisfactorily completed? 1. Checklist 2 has been satisfactorily completed? 2. Primary fenders are floating in their proper place? Fender pennants are in order? 3. Secondary fenders are in place, if required? 4. Over side protrusions on side of berthing are retracted? 5. A proficient helmsman is at the wheel? 6. Cargo manifold connections are ready and marked? 7. Course and speed information has been exchanged and is understood? 8. Ship’s speed adjustment is controlled by changes to revolutions and/ or propeller pitch? 9. Navigational signals are displayed? 10. Adequate lighting is available? 11. Power is on winches and windlass and they are in good order? 12. Rope messengers, rope stoppers and heaving lines are ready for use? 13. All mooring lines are ready? 14. All mooring personnel are in position? 15. Communications are established with mooring personnel? 16. The anchor on opposite side to transfer is ready for dropping? 17. The other ship has been advised that Checklist 3 is satisfactorily completed? 1. The ISGOTT Ship/Shore Safety Checklist has been satisfactorily completed? 2. Procedures for transfer of personnel have been agreed? 3. The gangway (if used) is in good position and well secured? 4. An inter-ship communication system is agreed? 5. Emergency signals and shutdown procedures are agreed? 6. An engine room watch will be maintained throughout transfer and the main engine ready for immediate use? 7. Fire axes or suitable cutting equipment is in position at fore and aft mooring stations? 8. A bridge watch and /or anchor watch are established? 9. Officers in charge of the cargo transfer on both ships are identified and posted? 10. A deck watch is established to pay particular attention to moorings, fenders, hoses, manifold observation and cargo pump controls? 11. The initial cargo transfer rate is agreed with other ship? 12. The maximum cargo transfer rates agreed with the other ship? 13. The topping-off rate is agreed with other ship? 14. Cargo hoses are well supported? 15. Tools required for rapid disconnection are located at the cargo manifold? 16. Details of the previous cargo of the receiving ship have been given to the discharging ship? 17. The other ship has been advised that Checklist 4 is satisfactorily completed? 1. Cargo hoses are properly drained prior to hose disconnection? 2. Cargo hoses or manifolds are blanked? 3. The transfer side of the ship is clear of obstructions (including hose lifting equipment)? 4. Secondary fenders are correctly positioned and secured for departure? 5. The method of unberthing and of letting go moorings has been agreed with the other ship? 6. Fenders, including fender pennants, are in good order? 7. Power is on winches and windlass? 8. There are rope messengers and rope stoppers at all mooring stations? 9. The crew are standing by at their mooring stations? 10. Communications are established with mooring personnel and with the other ship? 11. Shipping traffic in the area has been checked? 12. Main engine(s) and steering gear have been tested and are in a state of readiness for departure? 13. Mooring personnel have been cancelled (when clear of other ship)? 14. Navigational warnings have been cancelled (when clear of other ship)? 15. The other ship has been advised that Check-List 5 is satisfactorily completed? It may become necessary to transfer cargo from tank to tank after sailing from a port because of short loading, or to adjust trim or stress. This may be carried out provided the required degree of separation is maintained. When this operation is carried out the safety precautions for loading/discharging must be in force, and due regard must be taken of the need to avoid any accidental spillage. Internal cargo transfer may not be accepted by the charterers therefore prior to carrying out any cargo transfer operation, the Company’s permission must be obtained.